fter a four-hour bus ride, followed by a two-hour boat trip, Deborah “Deb” Bell has just completed the challenging task of lugging a group of students to one of the remote, swampy, impoverished villages in Guatemala. While passing by river-front wooden huts she greets waving locals lounging in hammocks and children paddling on cayukos, or small dug out wooden canoes. Deb sports a loose white button down blouse, pants rolled up to her calves and brown tennis shoes that have seen much of Sarstun’s muddy terrain. Her unstyled, ponytailed white hair and frameless follicles say she’s a bit too old to handle a group of college kids, but her modest enthusiasm says otherwise. “Be ready in five minutes,” Deb tells the group. She will be taking them to the local schools Refuge International helps fund. As founder and President of Refuge International, a volunteer program focused on bettering the lives of Guatemalans, there really isn’t any time to waste. It’s been past five minutes and Deb makes a final call before trekking uphill to the elementary. The rest of the group catch up and find themselves on a sticky mud trail that loops around a herd of cattle. As if the animals could talk, Deb greets them good afternoon, while the students cautiously speed walk avoiding eye contact. Deb who's about 10 meters ahead, takes a brief moment for everyone to catch up. The group is playing hopscotch on the path, avoiding deep wet-soiled spots filled with disease-filled worms wriggling at just about every cubic inch. “If anyone is willing to do this, I’d let it go,” she jokes about her job. Deb, a nurse practitioner from Longview, Texas, oversees everything from recruiting to fundraising and from medical missions to new educational projects. She explains that Refuge International’s mission statement is to fulfill basic needs in terms of healthcare and education. What’s not indicated on the website is the organization’s push to mentoring the next generation. “It’s very important that we take students and young people to the kind of work we’re doing,” she explains. After leaping over the last puddle of mudd, they finally reach the school, which looks more like an abandoned building with nothing surrounding it but more dirt and patches of grass, and a local woman hanging her laundry outside her home. The school, SCC Oficial Rural Mixta Alden Sarstoon, is a barred window building with a large garbage bag acting as a wall separating the fifth and sixth grade classes. About 10 shoeless kids are seated outside coloring. The rest of the students are learning the human anatomy in a room that lacks lighting and air conditioning. The students take turns walking to the teacher’s desk to take a sip from the classroom water bottle. Clean water is considered a luxury in Guatemala. Deb recognized this problem, and along with Refuge International volunteers, has started “The Water Project” in Sarstun, which has served over 10,000 people. In fluent Spanish she tells the teacher, a 20-year-old high school graduate, that there are boxes of notebooks, coloring books, pencils and even sandals sent in as donations for the kids. Rather than dropping off the box and calling it a day, she goes one-by-one handing each student a notebook. It’s the little things that count. And for Deb, each smile is worth it. She explains that in the United States it’s all about the numbers. Medical facilities are more focused on the number of patients they treat, rather than the quality care they provide. Deb recalls a time when the doctors at the Sarstun clinic delivered a baby last June. The mother was a poor widow with no source of income. She was malnourished, which also meant the baby was as well. “If you’ve never see a malnourished baby, they pretty much look like shrunken mummies,” she says. 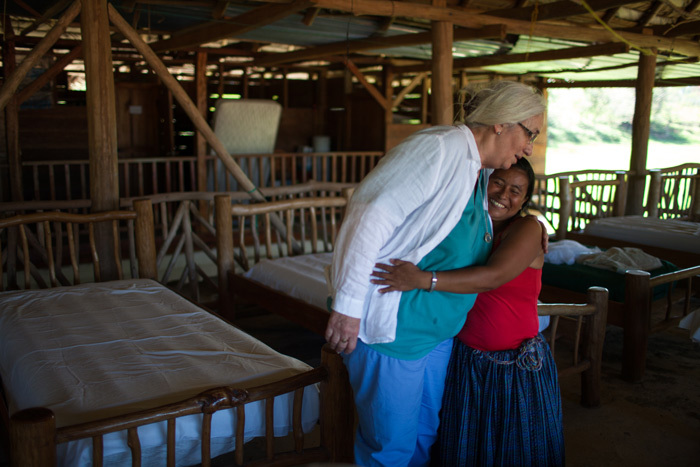 This individualized approach to helping the residents of Guatemala resonates in Deb’s stern, yet nurturing character. Since Refuge International’s clinics do not have all the elaborate tools typically found in a hospital’s operation room, the medical team must work with what they have, only offering basic medical procedures. However, the tools seem to expand, especially at the Sarstun location, Refuge International’s year-round clinic. “Today, Dr. Stanley and I were treating patients and some of them we were were unable to treat. If I just had the equipment, I can help this person,” Deb pauses and rolls her eyes up reminding herself of the equipment she needs to order. Dr. Jordan Stanley, an orthopedic surgeon who has worked with Deb for 15 years in Longview, said everything she does is genuine and that she’s always looking to improve the communities of Guatemala. “She’s a friendly and spiritual person. She thinks she’s been led to and that’s where she goes. She works, but doesn’t get paid,” he says. “Yeah, she doesn’t own this building. The community came together and built it,” Dr. Stanley says. As much as Deb wants the banner taken down, the community feels the need to acknowledge what she and Refuge International has done for the people of Sarstun. Before, Sarstun was considered the “worst looking area” in terms of location, health and natural resources. The village didn’t have running water, electricity or phone lines. 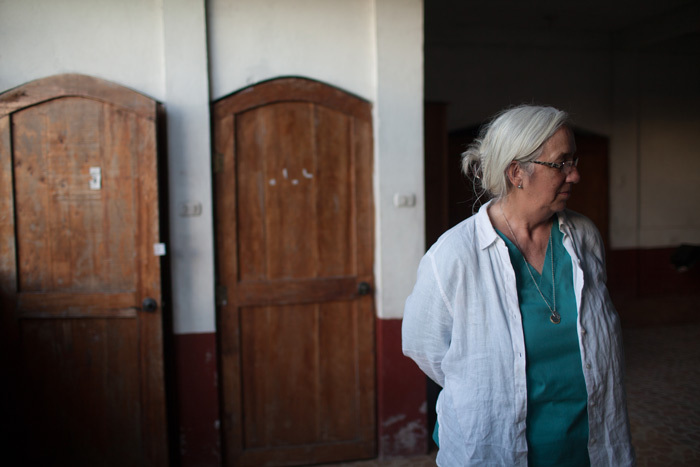 Although Refuge International has provided educational programs, medical and health services, she refuses to take recognition for any of it and points out that it’s the volunteers that make it all happen. “It’s actually embarrassing for someone to say, ‘I did something,’ because it wasn’t just me,” she says. In 2007, Deb was named Texas Nurse Practitioner of the year for her work with Refuge International and for improving the lives of those in the communities she’s worked in. In 2012, she was awarded Longview Rotary Club’s Citizen of the Year. Community members noted her “can-do spirit” and her ability to take on any physical or spiritual challenge made her the perfect candidate for the title. For Deb, it’s hard to accept an award in her name because each volunteer deserves to have their name engraved on a wooden plaque as well. Throughout the trip, she repeatedly detracts conversations away from herself and introduces “more important” people of the community such as the water circuit rider, the cook, the nurse assistant, the midwife, the mechanic and more. Although Deb may deny it, to say she is a generous person is an understatement. Her efforts with Refuge International and little individual acts of altruism is hope that everyone in the world will have access to basic needs. “There’s this sense that I’ve done something more with my life instead of going shopping,” Deb says looking down at her worn out shoes. Instead she rewards herself with more charitable work.